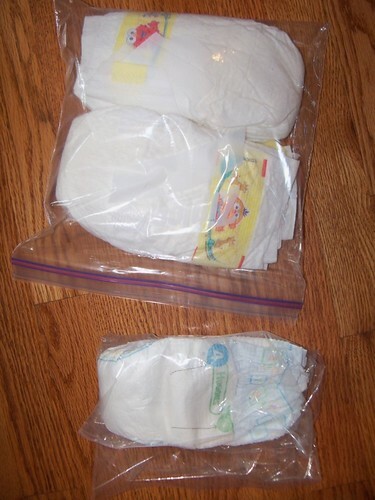 I’m so happy to report that this shipment of diapers and formula headed south and across the border last week. We thought we were building a load to take on our June construction trip, but God had in mind for the supplies to go earlier. What we sent in January with the men’s team had officially run out. Look what God had been growing in our basement the last two months to feed babies sooner rather than later! If I ever needed a reminder about God’s timing being perfect, here’s yet one more. Thank goodness for reminders. As I hauled up this load from the basement, one particular story came to mind over and over. Jesus was feeding the multitudes on the hillside near the Sea of Galilee. These pictures speak this to me – and remind me God is very pleased by this project and those involved in it. If you have an email account, I’m guessing you also get your fill of food and nourishment each day. I get way more than my fill. And all of you receiving this note have at one time given to the Babies of Juarez. Sometimes God calls us to sacrifice things or time or energy to give. Sometimes God calls us to give from what we have left over. Some of the pictures above illustrate “let nothing be wasted” by people giving one or two diapers to the babies rather than throwing them away—taking the time and making the effort to get these leftover diapers to me. 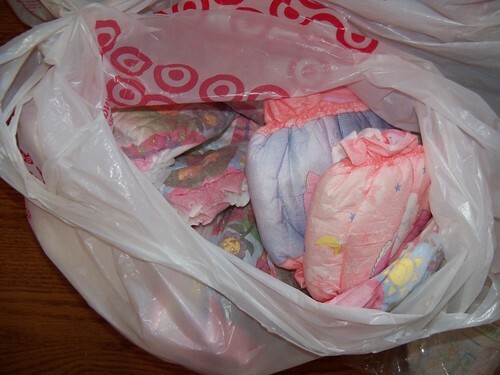 There are babies who desperately need those diapers to keep them from horrible discomfort and infection. The picture of the whole collection is full of examples of people who have sacrificed to keep babies in Juarez alive — and it is made up of people who have given from what they had left over. All of it together becomes something really beautiful to me. And if it’s drop-dead gorgeous to me, in all my humanness – you can just imagine how lovely it is to God. Like the most stunning of all sunsets. Thank you for your gifts. There are some new cool contributions here. 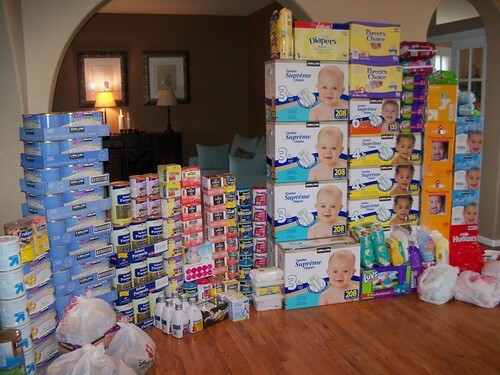 A 6-year-old girl from our church had been saving her change for a year to buy diapers for the Babies of Juarez. A friend from Sunday school got up the nerve to ask her pediatrician for any expired formula and left the doctor’s office with supplies. The Beth Moore study group at Cherry Hills got involved and gave diapers and formula. (Micki, would you please forward my gratitude?) Our pastor mentioned the project in a marriage class and sparked a huge interest (and drop-off!) from one of you. We even got one more Christmas present added to the mix. And there are so many other stories I don’t even get the privilege of knowing about, with mysterious drop-offs finding their way to our front porch. Adding to the beauty. Thank you for your gifts. Some of you have patiently waited for the Five Guys fundraiser update. (I really don’t want to inundate you with email, so decided to wait until I had the above to report.) We raised $350.14 that day! Thank you, thank you to all who came out and supported the cause. We knew the dollars wouldn’t be the main feature here – although that’s $350.14 worth of formula we didn’t have before…and that’s huge – but we also raised awareness and had many people learn about the project through the event. I just can’t thank you all enough for your support. I honestly spent most of that day wanting to cry, feeling so blessed. Thank you for your gifts. • Last time I asked you to eat burgers for the babies. Now we’re giving you an opportunity to drink wine for the babies. (There are some jokes and connections I can make to heart health here, but I’ll spare you.) Please see the attachment regarding a fundraiser a friend is putting together in record time. You can help by attending the event (I already know many wonderful people who will be there!) and/or spreading the word and/or donating something for the auction. Could be a $20 gift card for Jamba Juice; could be a week in Cabo. Everything helps! • Our next shipment of supplies goes June 1. • I have to give a shout-out to my faithful helpers. My two youngest kiddos get a big kick out of loading up the truck with supplies and insist on posing when I’m taking pictures for the website. The next generation of diapers and formula collectors are already hard at work. I love it. • Our June 2-5 trip to build homes outside the city of Juarez just had two spots open up. (By this I mean – room for two couples, two families, two individuals, etc.) If you’ve ever considered going, this would be a great team to join! Okay, time to close here. I don’t say this lightly, but you have all contributed greatly to my life. This project has brought me such joy – and you’ve been a big, big part of that. Thank you for partnering with me – and making this journey all that much more worthwhile.